We were back again at our partner, Auction House London's April Auction held at the London Regents park Marriott Hotel for another successful auction event. With over 130 lots listed for auction, as well as some last-minute lots which didn't make it into the auction catalogue but went under the hammer anyway. As usual the event began with a well-attended pre-auction property coffee morning event, where there was an excellent opportunity to network with other property professionals over tea and coffee. 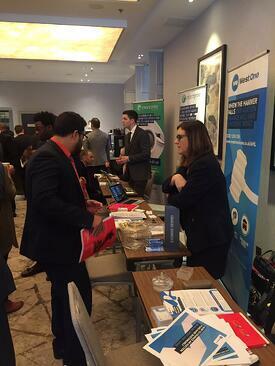 We met a wide variety of attendees at the networking event from people working with multiple property developers to landlords and those newer to property investment. 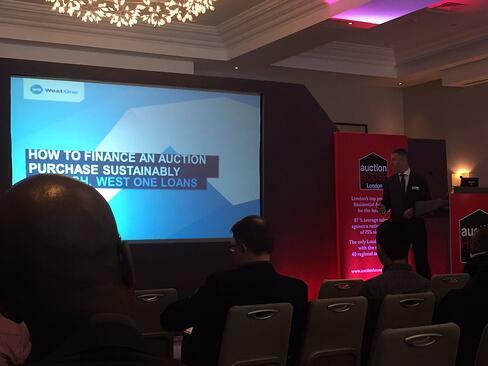 The property networking session was followed by a set of very interesting and informative talks by experienced specialists such as a solicitors firm, property investors and of course auction financing, from our very own Jim Nash from the team here at West One Loans. Jim Nash talked about how to finance an auction purchase sustainably. We learned that having pre-arranged financing can add more certainty to the process as pre-arranged auction finance will help us to understand if the property can be financed and how much we can bid up to on the auction day. There were several lots marked sold prior as they had been snapped up before the day. We also saw several lots that did not quite meet the reserve price in the room, but managed to clinch a deal moments later from one of the highest bidders. Not including the auction lots 'sold post', there were many lots which just didn't quite meet the reserve price. The auction ended with circa thirty unsold lots, many of which are still available; including lot 12 which was on the familiarly named Albert square in East London. Despite the auctioneer declaring at the start of the auction that 27 lots had been withdrawn from sale on the day, some of which may be made available again in the following auction, there were still a large number of bids on the remaining lots; with the auction house having to record the amount of every bid made. The auction welcomed a wide range of bidders with a wide range of budgets which reflected the wide range of guide prices in the auction catalogue. Most Expensive: Lot 61 Sold for £550,000 a four-bedroom converted and extended Edwardian lodge house on a substantial 2.5 acre plot. The house has undergone an extensive program of redevelopment but requires completing with further development. Least Expensive: Lot 52 - A landlocked plot of land in behind retail parade in East London which sold for £7,500 (Guide price was £10,000) It's quite rare for lots to sell for under the guide price. Most interesting lot: Lot 50 - A Commercial lease on a residential HMO house. Unsold at auction, but sold prior for an undisclosed amount. Most interesting lot: Lot 87 - A one bedroom flat subject to a periodic tenancy producing £5,200 per annum. Property auctions are always an interesting place for us to be at as many of the auction lots are the types of properties we can finance, such as mixed commercial lots, flats above shops, HMO's (House in Multiple Occupancy) and uninhabitable residences such as property without running water. We saw a wide variety of land and properties in the auction lots from those with low leases (leases under 70 years) to vacant properties and tenanted properties suitable for buy-to-let. We will of course be back again for the next auction with Auction House London which takes place on the 2nd of June 2017 at the Regents park London Marriott Hotel. We welcome you to come along to the pre-auction property networking event and look forward to the opportunity to meet you then. As always, if you would like the confidence and security of bidding with your financing already in place prior to the auction, submit an enquiry today.